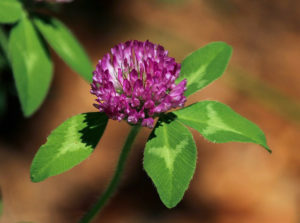 One of the largest of the clover species, red clover is the most famous for its believed magical powers. Since pagan times, people have thought it to have the ability to protect against witchcraft and evil spirits. People venturing into places where it was believed that evil spirits lurked would carry a sprig of the clover for protection. Phenolic acids (including salicylic acid and coumaric acids), flavonols, a range of isoflavones – including genistein, daidzein, formononetin and biochanin-A. Contains volatile oils and is a source of many nutrients including, vitamin C, calcium, chromium, magnesium, niacin, phosphorus, potassium and thiamine.